Cooking with wine always feels a bit special – there’s little more satisfying than the sizzling sound as the cool wine hits the hot pan and the aromas start filling the room. Moreover, it adds a delicious richness to any dish! This meal in particular is a beautifully stripped down, simple meal made with clear bold flavours. The wine and cream melding with the mushrooms and chicken fond is really a thing of beauty. Slice your chicken breasts in half horizontally – making them thinner like this will ensure they cook thoroughly in the pan without getting burnt/tough on the outside. Season with salt and pepper then fry in a little oil, turning every now and then. When the chicken is beginning to brown, remove from the pan and cover with a little foil. Add your chopped onions and a sprinkling of salt, and sweat until beginning to soften. Add the mushrooms, a few grinds of black pepper, a spoonful or so of dried sage, and crank up the heat slightly. Once the moisture from the mushrooms has been extracted then evaporated, pour in your white wine. Allow the wine to bubble away a little, stirring to release all the flavour from the bottom of the pan. After a few minutes, when some of the alcohol has had time to evaporate, pour in a decent splash of cream and stir through. Taste the sauce and adjust seasoning as you need. Add the chicken back to the pan to heat through again, then serve. If your sauce is thickening too much while the chicken heats, don’t be afraid to add a little splash of water. 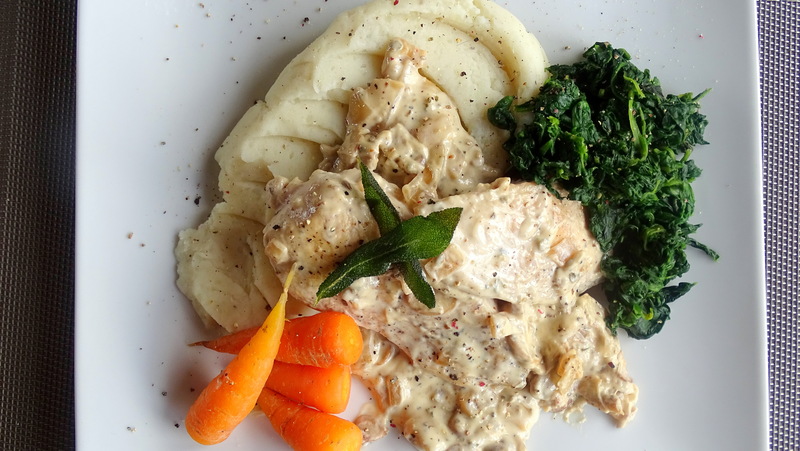 I served mine with some soft mash and steamed vegetables, topped with a few crisp fried sage leaves. 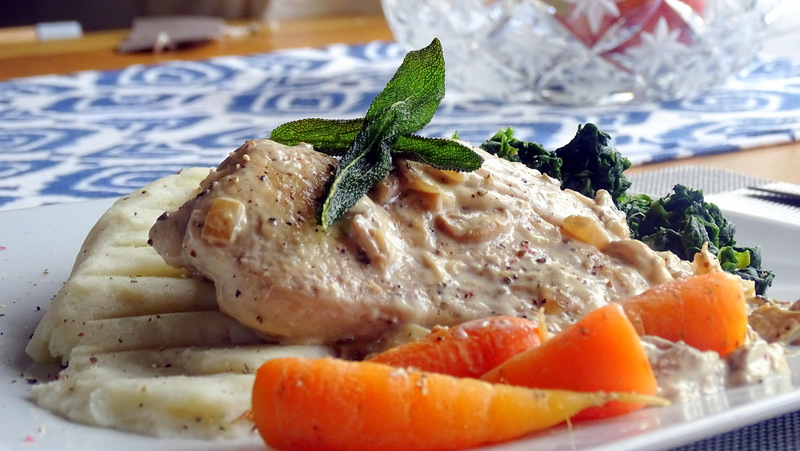 Posted in Guesscipes, Mains, PoultryTagged chicken, food, guesscipe, mushroom, Poultry, recipe, romantic, sage, valentines day, white wine, white wine sauce, wine sauceBookmark the permalink.